Some years ago, we were working very hard to create city search auto complete box. We needed to create database for city list and then retrieve the city list from database using j query/Ajax. 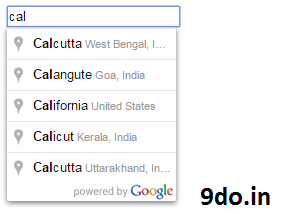 But now, Google provide the facility to create city search auto complete very easy. Now we need to paste a URL from Google and write some lines of code that's it. In this post we will create the city search box without using database. First of all we will create a html file called index.html. Then paste the below code before closing </herad> tag. // populate the address fields in the form. And then, we will call city_search() function on onfocus event. Now we are done. open the index.html file in brwser and type any city name. If all the things are correct then you will see the result like this. Thanks for your comments. i will write write the post for search city by name soon. once again thank you.